Man and woman do not live on breakfast alone, so we serve delicious lunches and dinners daily from Tuesday to Saturday, 11am-10pm. Enjoy a meal in our large dining room or outside on our café patio in the summer. We have great food for every taste. Your choice of BBQ, Ranch, or Honey Mustard sauce. Tender clam strips in a light breading, served with cocktail sauce. Breaded mild jalapeño peppers stuffed with cream cheese and served with ranch dipping sauce. Fresh mixed fruit over romaine lettuce with onions, tomatoes, mixed nuts and raisins. Served with our Sweet & Creamy Dressing or House Dressing. A breaded chicken breast dipped in our hot sauce over romaine lettuce with tomatoes, onions, croutons, hard-boiled eggs and grated cheese. Served with our House Dressing and creamy or crumbly blue cheese. Fresh strawberries over romaine lettuce with onions, tomatoes, mixed nuts and raisins. Served with our Sweet & Creamy Dressing or House Dressing. Swiss cheese and corned beef over romaine lettuce with tomatoes, onions, cucumbers, croutons and hard-boiled egg. Served with Russian or House Dressing. Romaine lettuce served with croutons, grated Romano cheese and Caesar dressing. Grilled chicken with croutons, grated Romano cheese and Caesar dressing, served on romaine lettuce. Crisp lettuce served with tomatoes, onions and cucumbers with our House Dressing. Served with tomatoes, cucumbers, onions, pickles, olives and hard-boiled egg. Crisp lettuce served with tomatoes, onion, cucumber, chick peas and croutons. Topped with creamy Italian dressing. 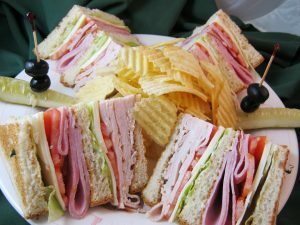 Thin slices of ham piled high and topped with lettuce, tomato and mayo. Egg salad with lettuce on choice of bread. Fresh chunk light tuna served with lettuce. American cheese grilled on your choice of bread. Roast beef sliced thin and piled high with lettuce, tomato and mayo. Our ¼ pounder topped with American cheese, lettuce, onion, tomato, and mayonnaise. ¼ pounder topped with American cheese. Our ¼ pounder topped with lettuce, onion, tomato and mayonnaise. A juicy ¼ pounder grilled to your liking. Thin slices of turkey piled high and topped with lettuce, tomato and mayo. A breaded breast of chicken topped with Swiss cheese and bacon, served on a hard roll with a side of honey mustard. A breaded breast of chicken topped with our red sauce and melted mozzarella cheese. Served on a hard roll. Roast beef on garlic bread with Swiss cheese. Turkey and Swiss cheese with Russian dressing on a French roll. Tender breaded veal topped with our red sauce and melted mozzarella cheese, served on a hard roll. Italian sausage topped with sweet peppers served on a hard roll. Our tasty meatballs covered with red sauce and on Italian bread with mozzarella cheese. Lettuce, tomatoes, mushrooms, cucumbers and Provolone cheese on pumpernickel with Russian dressing. Scrambled eggs, pepperoni, hot peppers and sweet peppers, omelet-style, with Provolone cheese on a French Roll. Homemade meatballs served with mozzarella and red sauce on a French roll. A breaded breast of chicken dipped in hot sauce and topped with lettuce, on a hard roll with blue cheese served on the side. A lightly breaded breast of chicken topped with lettuce, tomato and mayonnaise on a hard roll. Corned beef on rye with sauerkraut, Russian dressing and Swiss cheese. Scrambled eggs with onion and ham and served on white bread. Ham, and Swiss with tomatoes, cucumbers and French dressing on a French roll. A generous portion, served with our delicious sauce. Stuffed with Ricotta cheese and covered with mozzarella. Jumbo shells stuffed with Ricotta cheese and covered with mozzarella. Grilled, skinless breast of chicken served with lemon, vegetables and French fries. Breaded chicken topped with mozzarella, served with a side of spaghetti. Pasta shaped like flowers and served with our delicious sauce. Breaded veal served with lemon, vegetables and French fries. Breaded veal topped with mozzarella, served with a side of spaghetti. Old-fashioned homemade potato pasta served with our delicious sauce. Layers of egg noodle pasta and rich meat sauce. Ricotta, mozzarella, and Parmesan cheeses. Oven roasted, tender beef covered with brown gravy and served with french fries. Add grilled onions, peppers or mushrooms for $2.29. Tender beef served with French fries and vegetables. Tender 6 oz. steak, served on toast with French fries and salad. Add grilled onions, peppers or mushrooms for $2.29. Breaded filet of haddock topped with mozzarella cheese and our original sauce with a side of spaghetti. Breaded shrimp and scallops served with french fries, cole slaw, tartar sauce and cocktail sauce. Breaded scallops served with French fries, cole slaw, tartar sauce and cocktail sauce. Breaded filet of haddock, shrimp, and scallops, served with French fries, cole slaw, cottage cheese, tartar sauce and cocktail sauce. Breaded shrimp served with French fries, cole slaw, tartar sauce and cocktail sauce. Breaded filet of haddock served with cole slaw, French fries and tartar sauce. New York style with cherry topping. Two scoops with chocolate sauce, if you like. We can accommodate groups for: Banquets, Corporate Meetings, Rehearsal Dinners, Graduations, Special Occasions, Team Dinners.